On outdoor installations, expansion joints must be installed on straight duct runs greater than seventy feet. ATS recommends expansion joints made of EPDM. EPDM will not only provide ultraviolet protection but corrosion resistance to alkalis and acids as well. 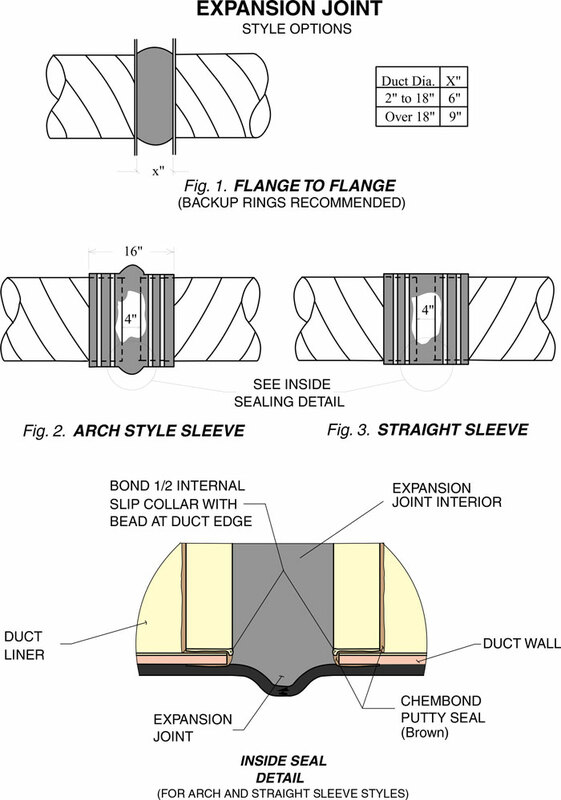 EPDM flexible connectors are recommended for connecting the duct to the scrubber and fan to minimize the vibration transfer from the equipment through the duct. Important Note: Δ°F refers to change in duct temperature, not ambient temperature. A rule of thumb to use in figuring expansion of ATS StaticSafe Duct™ is three inches per hundred feet per one hundred degrees in Fahrenheit temperature fluctuation. This is equivalent to 75 mm per 37.75 degrees Celsius temperature fluctuation. NOTE: The properties or applications shown above are given for general information. The suitability of a material for your application should be evaluated by a qualified engineer. The above information has been compiled from several expansion joint manufactures’ data,we assume no responsibility for errors.